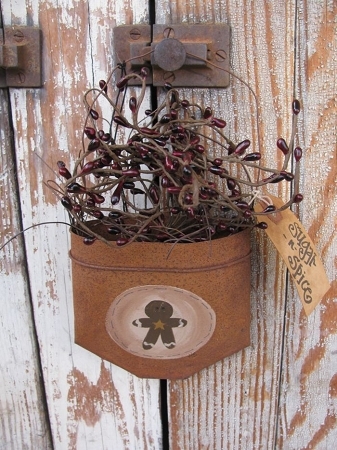 Primitive Country Gingerbread Hand Painted Rusty Tin Hanging Pocket. Adorable kitchen accent piece. I've been getting a lot of requests for Gingerbread items. 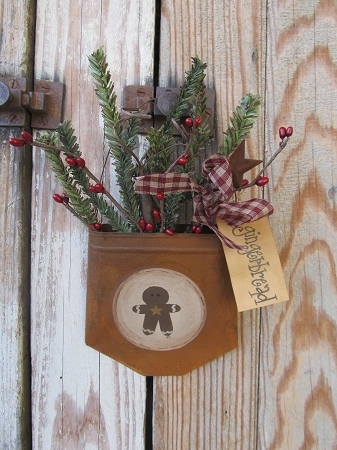 Choice to have the pocket to be filled with pine or burgundy pip berries stuffed inside. That way if you decorate with gingerbread year round you have the option. PLUS you get your choice of sayings on the tags. Size is 4.5"x5" Hand painted, designed and signed by Heidi.